Ten out of ten of world tallest buildings are characterized as stand-alone objects where political and capitalist agenda take physical forms. Singapore, known as country which has been long lacking of physical-spatial representation of cultural identity through tall building called for a profound typology of high rise building in recreating reciprocity between physical context of the past and the new. The interplay between the existing buildings and proposed idea presents criticism on present political, management and urban planning discourse, where desire of developer, city rules and regulation cause city donut effect where city centre is only active by traffic density during working hours, dead towers and spaces within and around buildings in terms of function, frequency of use, and density type in everyday routine pattern of user. 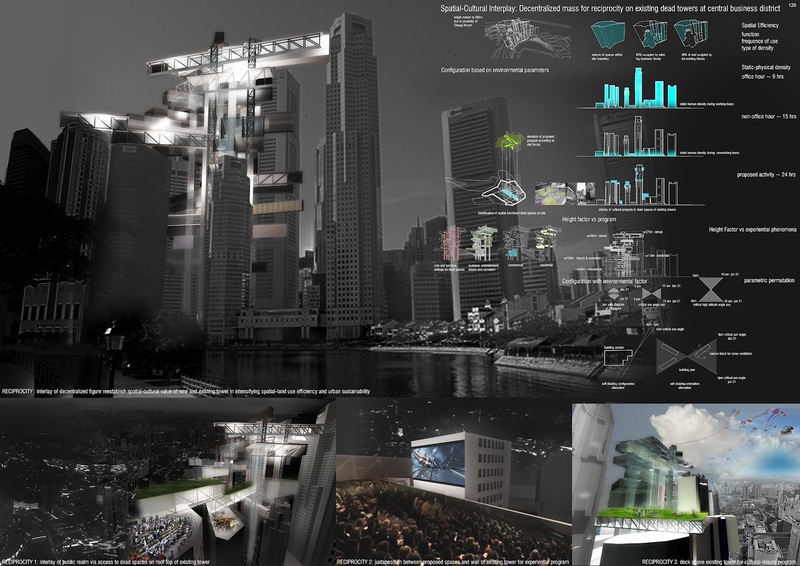 This project foresees future land shortage issue which reciprocally shaping city land use sustainability, identity, the way people lives and it is conceived as layers of partial-configurations in re-establishing value for proposed and existing tall buildings where tallness may be utilized as retreat purposes due to relative and experiential distinction from lower level or ground level. Reciprocity is the main idea of this project where the relative phenomena of height factor that high rise building possesses is utilized as alternative accesses to towers roof top, podium and spaces in between towers where these spaces would not be spatially accessed conventionally for retreat purposes with programs like eatery, leisure and cultural activities such as kite flying. The juxtaposition between the interlay and existing towers forms spatial-functional propensity during non-office hour, activating the dead spaces among towers and the central business district by reinforcing efficient land use and relative experience. The articulation of public realm to high ground on one hand created shadow pattern on the existing square where spaces can be used with culturally pleasant, on the other hand proposed form created proximity with existing towers structure where experiential program takes place.